New Zealand Vintage Computer Forums • View topic - Fountain, it goes! Ok I'm pretty sure these are common, Fountain Games Console, two controllers with 12 keys + 2 fire buttons + joystick, uses cartidges. 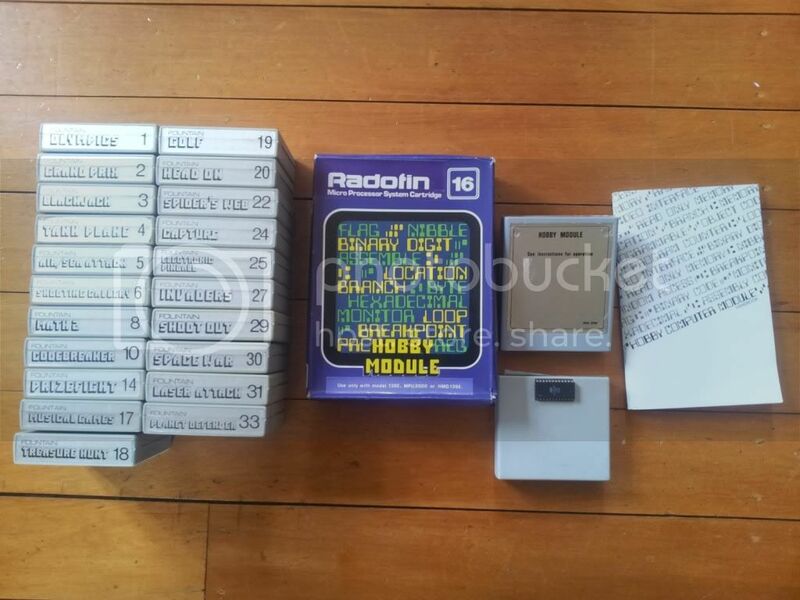 Not sure on age, but the games are compatible with consoles dating from 1976 to 1982 - so I'm figuring around 82/83?? Anywho hooked it up to my 42" LCD, did an auto-scan and it found a black screen. I flicked it to OFF and it went to fuzz - I'd found it! It does make a buzzing noise when plugged in, which made me a little uneasy, but worked great. My console looks more like the ROM tester at the bottom than the Force 2 above it. Nothing is dated. Think mine is the generation before the Force range. If anyone knows more about these, I'd love to hear any information you have. I remember Fontain video consoles being around in the late 70s/early 80s. Never played with one though. Good find. Dedicated video game consoles were knocked off their perch for a few years by" home computers" only to make a reappearence at the end of that period in the form of Sega/Nintendos. 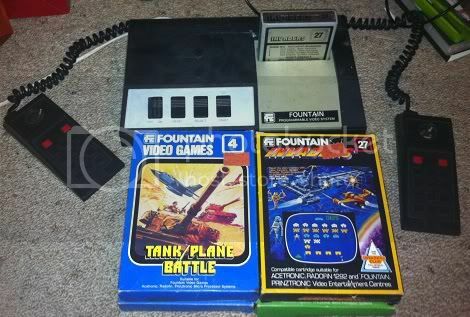 There were two releases - Fountain Force 1 and Force 2. No real major differences between them. System wise its a clone of the Interton VC4000 family of consoles.. Probably the most successful sales wise of all the early NZ consoles and they used to be pretty easy to find in the wild. I've got dozens of spare games if anyone is looking for them. 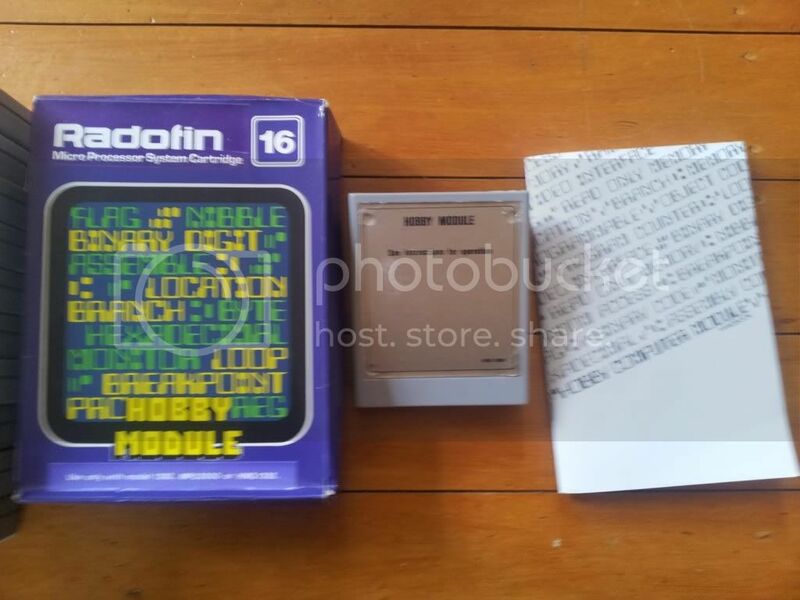 The most interesting (and rarest) release is the "Hobby Module" (progamming add-on) - grab one if you ever see it. It effectively turns the Fountain into a "Elektor TV Games Computer"
*edit* - can't work out how to embedd youtube clips so just a link to youtube. do you know what year they were released? and what year the Force 2 replaced the original? Were the NZ games actually written here, or copies of overseas games assembled here? and I'm sure there is another couple. Will photo/video when I get home. Don't think I have ANY controller overlays tho. Would be keen to buy the little screw on handles for the controllers if you have or know where I can get spares/something else that fits. I believe the "Force 2" dates to circa 1984 - it was "old" technology wise when it was released. I really need to sort through my collection and put together a better timeline. I first saw one at large Computer Show in Palmerston North (at the Showgrounds?) and at the time we thought it was a bit of a jok. I was full on into the Apple II at that stage and the Apple games were lightyears ahead. This was 1985? I know we saw lots of Apple II gear on display + IBM Jr.
None of the Fountain games were written here - they are all copies of overseas ones! They were assembled here (hence the Factory ROM Checker that I own) and boxes / plastics made here - all to qualify for the "Made in New Zealand" status. Going home tonight for multiplayer pong action and maybe some space invaders. Push my Xbox360 to one side. And yeah I figured it was pretty low down in the scheme of things hehe. Just amazed it still works! I imagine using the hobby cartirdge would've been rather painful, did you ever try one out? You just totally reminded me that I have the Acetronic version of the Force2 in the shed. It didn't work properly last time I tried it, but that was easily ten years ago, likely more. I bought it back then for $2.00 at a garage sale Might have to drag it out and have a squizz. Got manuals for a couple of the games, but no controller overlays. Stickers on the box say '29.95' which is then crossed out and someone has written FREE and circled it. I'm not sure if my left controller is worn or if the Space Invaders on this console was just really bad. I can move left and right ok but if I let the joystick go too far down or move too quick while press fire - it doesn't move until I change direction again. 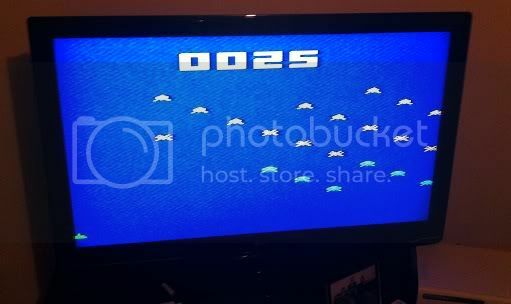 Olympics was fine (response wise), might try 2 player to see if it's just a bad controller or if Space Invaders was just too much for the 1975 8 bit proc and I'm being picky. NB: not sure if it matters, but it's not marked as a "Force", or was that just a nickname given to the model before the Force 2? Just says Fountain Programmable Gaming System (or something like that). Holey cow! That was the first console that we owned - my parents said "If we buy you kids this machine, you have to promise to stop wasting money on those video games at the dairy" - Fat chance that worked. And a nice archive of old games for this emulator from Amigan (Winarcadia site) is listed under the "packs" section of the above mentioned site... Direct link below. Ah, the good old days are alive once again! Nice to see some other NZ fans of the fountain console. I was "lucky" enough to be given one by my uncle a few years back, and it has started a slight obsession which has resulted in the me now owning four consoles and many (but not all yet) of the released games. My personal favourite: The hobby module, which I picked up complete with box, manual and overlays. 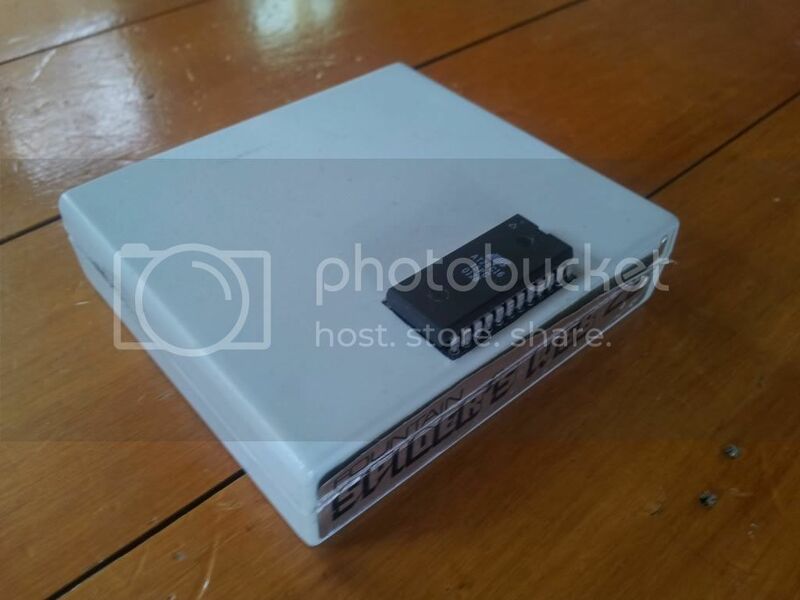 I had a dig and found mine, but damned if I can find the power adapter and its no standard pinout. Anyone able to give me some insight into what the pinout is and what volts it needs before I start trawling the internet? Carcenomy - if I don't forget I'll have a check on mine, from memory mine just had a mains cable coming out the back? Could be wrong though. I haven't done much with my unit unfortunately, I somewhat had my moment of nostalgia (was my first console too) but couldn't really enjoy the games enough to keep it a regular thing. I should probably test again and bundle it up to pass on to someone else, along with that extra XT (a man only needs so many 5160's). The cover plates for the controllers. Mine are mostly boxed, some with instructions, but not a single cover plate. But yeah value for them is really low.